But after returning from a particularly successful day searching for yard sale treasures, Sarah finds a grisly surprise in one of her bags: a freshly bloodied shirt. . .that undoubtedly belongs to her ex, CJ, who now happens to be Ellington's chief of police. If that's not bad enough, it seems Tiffany has gone missing. 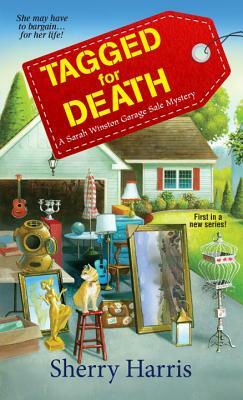 Now it's up to Sarah to prove that her cold-hearted ex is not a cold-blooded killer. . .
Sherry Harris is the author of Agatha Award-nominated Best First Novel Tagged for Death, The Longest Yard Sale, and All Murders Final! Sherry started bargain hunting in second grade at her best friend’s yard sale. She honed her bartering skills as she moved around the country while her husband served in the Air Force. Sherry combined her love of garage sales, her life as an Air Force spouse, and her time living in Massachusetts as inspiration for this series. Sherry is an independent editor for fiction and nonfiction writers, a member of Sisters in Crime, Sisters in Crime New England, and Sisters in Crime Chesapeake Chapter. She blogs with New England mystery writers at WickedCozyAuthors.com.